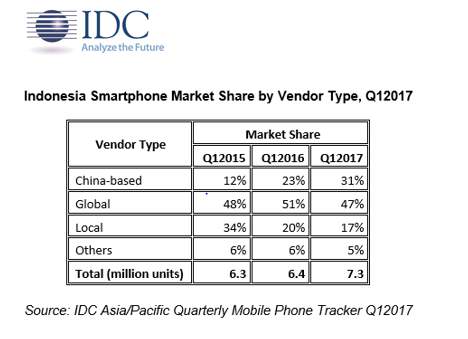 Jakarta, July 18th, 2017 – According to the latest International Data Corporation’s (IDC) Quarterly Mobile Phone Tracker , the smartphone shipments in Indonesia recorded 7.3 million units in Q12017, a 13% year-over-year (YoY) growth. However, there was a 15% quarter-over-quarter (QoQ) decline. The top-5 smartphone vendors in Q12017 were; (1) Samsung, (2) OPPO, (3) Asus, (4) Advan, and (5) Lenovo (including Motorola). The China-based vendors have been focused on both below- and above- the-line marketing activities, mainly billboards, flyers, TV ads etc. All complemented with the hiring of brand ambassadors, consisting of mainly popular local young celebrities that their target segment can relate to. More sales personnel were hired as well to further push the sales of their products nationwide. Local vendors, struggling to compete on such a scale have been coming up with alternatives such as launching their in-house applications, bringing competitively priced smartphones with similar specs (to the China-based ones) and more focus on lower-tier cities and rural parts of the country. Among the China-based vendors, OPPO and vivo are the most notable brands in the Indonesian market, competing in the space with their marketing initiatives, attractive incentives and margins for their channel partners, and enhanced post-sales services to address the negative stigma of China-based smartphones. This has set a new standard for some of the global and local vendors scrambling to add more to their marketing activities in order to match the new standard of competition. Furthermore, the China-based vendors have positioned themselves well in the mid-range segment with most of their handsets priced at US$200<US$400. Due to the lack of brand equity, local vendors’ attempts to match them were unsuccessful, resulting in them having to continue playing in the low-end segment of <US$200. However, this has not dampened the local vendors’ attempt to gain back share in the smartphone market as they try to provide more value-added services such as Advan developing its own Android user interface variant called IdOS, Polytron with its own Android user interface variant called FiraOS, and Evercross partnering with Foxconn to develop their “Luna” series smartphones, a complete re-branding of Evercoss which armed with more features and better build is aimed at the growing mid-range users. “In the coming times, the competition could further intensify with BlackBerry’s (via BB Merah Putih) and Xiaomi’s re-entry in the market in Q12017, and HMD’s Nokia expected to come soon in this year, all competing in the mid-range segment. While feature and technology innovation remains very important to sustain future growth, some local vendors will continue to make efforts to localize their product and service offerings to address the specific needs and preferences of Indonesians, as we have seen Advan’s smartphones bundled with locally developed apps such as Muslim Guide for Ramadhan,” ends Risky .